AUGUSTA, Ga. and PUEBLO, Colo. (March 20, 2019) — Morris Magazines, LLC, a leading global media company, and Professional Bull Riders today announced a multiyear media rights representation agreement for Road to the Horse: World Championship of Colt Starting. Under the agreement, PBR will represent the rights to the company’s signature equestrian competition and stream the annual event on RidePass, its leading western digital network. Additionally, PBR will develop international TV distribution and original content strategies for Road to the Horse in partnership with corporate parent Endeavor and Morris Communications, LLC. 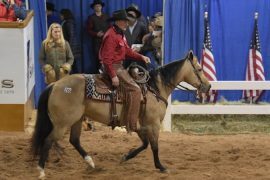 At Road to the Horse, the world’s best equestrians are challenged to build a partnership with an untouched three-year-old American Quarter Horse across three intense days of competition. Fans witness the entire journey, from colt selection to the final obstacle challenge. One competitor earns a $100,000 purse and the World Championship of Colt Starting title. All rounds of competition will stream live on RidePass from March 22–24 from Kentucky Horse Park in Lexington, Kentucky. For the first time, two past Road to the Horse Champions will battle head-to-head for the 2019 World Championship of Colt Starting. International showjumping sensation and two-time Road to the Horse World Champion Vicki Wilson will meet Road to the Horse 2016 World Champion and National Reined Cow Horse Association Snaffle Bit Futurity Champion Nick Dowers to vie for the title. Fans will also witness the Wild Card competition featuring Ben Baldus, Wade Black and Booger Brown—known for his starring role in The Cowboy Way on INSP network—competing for a spot in the 2020 World Championship. Full coverage of Road to the Horse is available through a RidePass Annual Membership or Pay-Per-View purchase at https://welcome.ridepass.com/rtth. The agreement with Morris Magazines, LLC, represents PBR’s eighth significant media rights representation agreement for events carried on RidePass as well as offered to broadcast and cable outlets, including Calgary Stampede; Days of ’47 Cowboy Games & Rodeo; Indian National Finals Rodeo; National High School Rodeo Association; United States Team Roping Championship; World Champions Rodeo Alliance; and World Series of Team Roping. Morris Communications, LLC, is home to the world’s premier media brands focused on original, expert-driven content delivered across the globe in print and digital formats on topics including travel, outdoors, local interest, western and equine. With a history and heritage in publishing dating back to 1785, the company today delivers stand-out magazines, mobile apps, specialty websites, trusted guidebooks and always-in-their-pocket travel maps. The Morris Media Network Equine Group consists of some of the industry’s most recognized equine publications, including Western Horseman, Quarter Horse News, Barrel Horse News and Equine Journal. The group also includes the equine portal site HorseCity.com and business-to-business publication, Western Lifestyle Retailer, and is home to Equistat, a statistical service offering detailed information and earnings for a variety of disciplines within the performance horse industry. RidePass is the leading western sports digital streaming network featuring more than 125 annual live western sports and PBR events across the globe, as well as original series, news, highlights and rider interviews. Since launching in February 2018, RidePass has carried over 500 hours of western sports programming. In the digital network’s first year, fans watched more than 42 million minutes of live and on-demand content from 93 countries. The world’s premier bull riding organization began as a dream of 20 bull riders 26 years ago and now competes in five countries. On its elite tour, the organization features the top 35 bull riders in the world and the top bulls in the business. The televised PBR Unleash the Beast tour, along with the PBR Pendleton Whisky Velocity Tour (RVT), the PBR Touring Pro Division (TPD) and the PBR’s international circuits in Australia, Brazil, Canada and Mexico have paid more than $184 million in earnings to athletes. Thirty bull riders have earned more than $1 million, including two-time PBR World Champion J.B. Mauney who has become the top-earning athlete in Western sports history with more than $7.3 million in career earnings. PBR is part of the Endeavor (formerly WME | IMG) network. For more information on the PBR, go to PBR.com, or follow on Facebook at Facebook.com/PBR, Twitter at Twitter.com/PBR, and YouTube at YouTube.com/PBR.